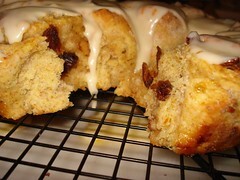 Orange Date Walnut Buns | Mmm, Tasty! Remember back in October when I made cinnamon buns in less than an hour? Well, I decided to change them up this weekend and do something different. Now, I love cinnamon as much as anyone. However, I find it to be a very fall/winter sort of flavour. For the first long weekend of the summer here in Canada (Victoria Day!) I knew I wanted to do something citrus-based, but wasn’t sure exactly how. So off Rich and I went to the grocery store to pick up the dough ingredients, along with a good sized bag of mandarin oranges and lemons. While putting these together, I decided to toss in some walnuts and dates that I already had, and voilà, these were born. As they were baking, I was a bit disappointed in how they were turning out. When you bake cinnamon buns, the whole house fills with the amazing scent of cinnamon and other spices, but these buns did not have the same effect; I could detect a hint of orange if I stood near the oven, but that was about it. Fortunately, the real test is the taste test, and these were fantastic. 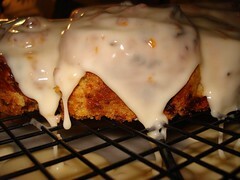 The blend of citrus and sugar, of sour and sweet, of tender dough and gooey icing. I think I almost like them better than the original. Serve them after dinner with coffee, or for breakfast if you have a real sweet tooth. Or maybe both. Heat oven to 400F. Grease sides of a 9 or 10 inch springform pan with cooking spray. If you don’t have a springform pan, don’t worry – a large, round cake pan or pie plate worked fine for me. Make dough: In food processor, combine cottage/ricotta cheese, buttermilk, sugar, melted butter, and vanilla. Process until smooth, about 10 seconds. Add all remaining ingredients listed under dough and process in short pulse bursts until the dough just barely clumps together. Then remove the dough from the food processor and place onto a lightly floured surface. Knead until smooth (add in a little more flour if you need to), then roll out with a rolling pin to approximately a 12″X15″ rectangle. Make filling: Brush the dough with melted butter, leaving a 1/2 inch un-buttered border around the edges of the dough. Sprinkle with sugar, then the juice. Cover with the walnuts and dates. To roll up: starting at the long edge, roll the dough into a long ‘log’, the same as you’d do if making a jelly-roll. Pinch to seal the seam, but leave the ends open. Cut dough into 12 equal pieces with a sharp knife, and place into your greased pan. It is fine if the buns touch, but don’t worry if there are spaces between them; they will rise and spread as they bake. Bake for 20-28 minutes until golden brown and firm to touch. Allow to cool for 5 minutes, then run a spatula around the outside edge of the buns to release them, and remove the outside of the springform pan. Allow to cool completely before icing. At this point you and your family may test a bun or two, to make sure they are indeed tasty. Rich and I did exactly that simvastatin medication. It’s for the greater good, you know. Icing: Mix well all ingredients listed under icing. You should get a smooth, thick, but pourable icing. If you find it is too thick, add a little more juice (1/2 Tbsp at a time). If you find it is too thin, add a touch more confectioners’ sugar. Pour over the buns and then serve immediately. So what’s up with the Sugar High Friday image? Well, I’ve been following Sugar High Friday, a concept started by Jennifer of The Domestic Goddess, for about a year now. The idea is simple: Every month, bloggers from around the globe make a dessert based on a theme ingredient or concept. The last Friday of the month, the host blog posts a ’round up’ of the entries, so you can see what desserts everyone came up with, and of course nab some of the recipes for yourself! Anyhow, every so often I think I might want to try participating, but then suddenly it is the end of the month and I’ve missed out again. This month, with the theme being citrus (and hosted by Tartelette), I decided I just had to participate, providing my citrus buns actually turned out delicious. I’ll be watching Tartelette’s blog next Friday to see what other desserts people made!